The 1869 South Carolina State Population Census is available on FamilySearch.org. It was the first census taken that lists African Americans. This index lists the number of children from 6 to 16 by race and gender, number of males over 21 by race, and number of persons of all ages by race and gender. No other members of the household are named other than the head of household, however, this can be beneficial if an ancestor was not able to be located on the 1870 United States Census. Go to 1869 South Carolina State Population Census and choose the county you would like to search. Click on the camera icon at the end of the row. Then you will need to find the county and then the image with your ancestor on it. Each of the following counties are available: Abbeville, Anderson, Barnwell, Beaufort, Charleston, Chester, Chesterfield, Clarendon, Colleton, Darlington, Edgefield, Fairfield, Georgetown, Greenville, Horry, Lancaster, Laurens, Lexington, Marion, Marlboro, Newberry, Orangeburg, Pickens, Richland, Sumter, Union, Williamsburg, and York. This record is missing for the counties of Kershaw, Oconee, and Spartanburg. I added this record to the Research Wiki entitled South Carolina African Americans: Census Records. 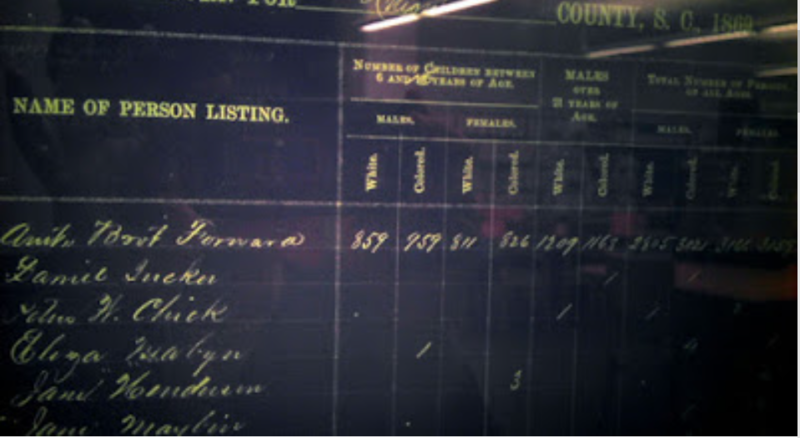 Eliza Maybin on the 1869 State Census for South Carolina, image, Greenwood County Library System, accessed 27 November 2013, Union, microfilm. I created a chart below. Jas. Anderson Tucker, and Pettus W. Chick, and James Kincaid Vance, are enslavers and forefathers. Beverly Vance, Andrew Johnson, Eliza Maybin, and Henry Sims are all African American ancestors. I am fortunate that they all still lived near each other. I am also fortunate to be able to find my 3rd great grandmother, Eliza Maybin living next to Pettus W. Chick. She changed her name to Eigner in 1880. Her son, Anderson changed his name from Maybin to Eigner to Chick. I have yet to figure out how the surnames of Maybin and Eigner tie in. Find as many ancestors as possible at FamilySearch.org on The 1869 South Carolina State Population Census. You will need to browse to your ancestor once you locate the film which he or she is on. This is one good way to identify the former enslaver if they lived near each other. Let us know you were able to accomplish this in our Facebook Group.